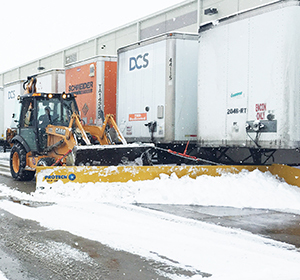 The Low Profile Angle Sno Pusher allows customers to easily clear snow from underneath objects such as the fifth wheel pin of unhitched trailers (6 feet of reach). Perfect for distribution centers and other large properties, the Sno Pusher’s 30 degree angle and side discharge allows for both the containment and windrowing of snow. The Low Profile Sno Pusher features an extruded, high quality rubber cutting edge that can be used on a variety of surfaces. The Low Profile Angle Sno Pusher comes standard with a 10 year warranty. Visit snopusher.com for pricing and specifications.